A few months ago, I was 'overly' inspired when I saw Dayna Collin's "Art Alley Studio" series or works she called "Curious Elements", you can see all 120 of them if you go to her blog and search under "Curious Elements" but here you can see a good sampling. I have to say, I was 'taken' by the entire series, and I knew I had to try my hand at it. . . . They say "imitation is the sincerest form of flattery . . ." I prefer to think of it as 'pure inspiration ". 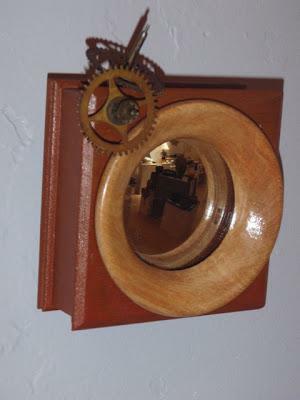 . . although I cannot say my pieces are anywhere close to the quality of her work, (her's are truly amazing) I wanted to take a stab at it, and this is the first of my five. Please do take a look at her work, here is another post, all of it is amazing, and I am hooked. I will post the rest of them over the next few days/weeks. 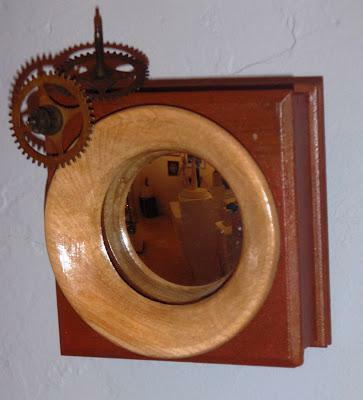 "Time Watch" is a small (2"x2") box containing a convex mirror and clock gears. . . simple, yet elegant.